So happy it’s finally Friday!! The past couple of weeks at work have seemed so long. I am so grateful that the weekend is here. 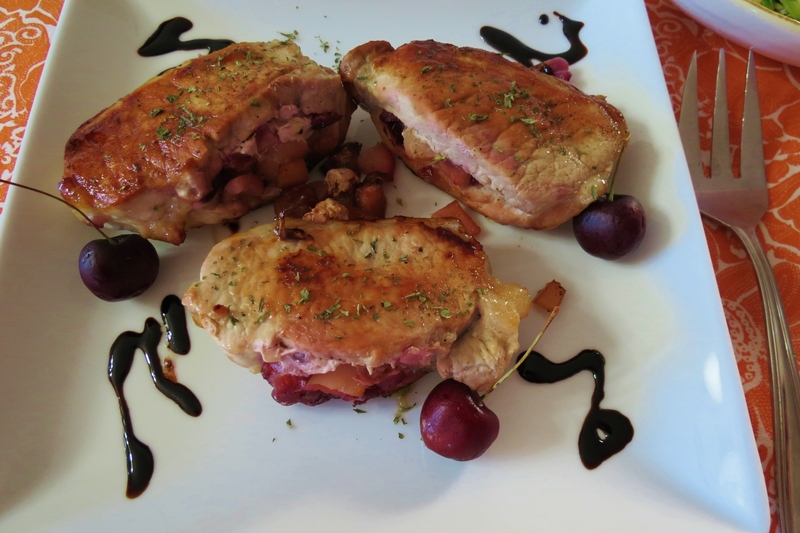 Today I thought I would share with you a semi-fall dish, since the weather seems to be getting a little chillier here. 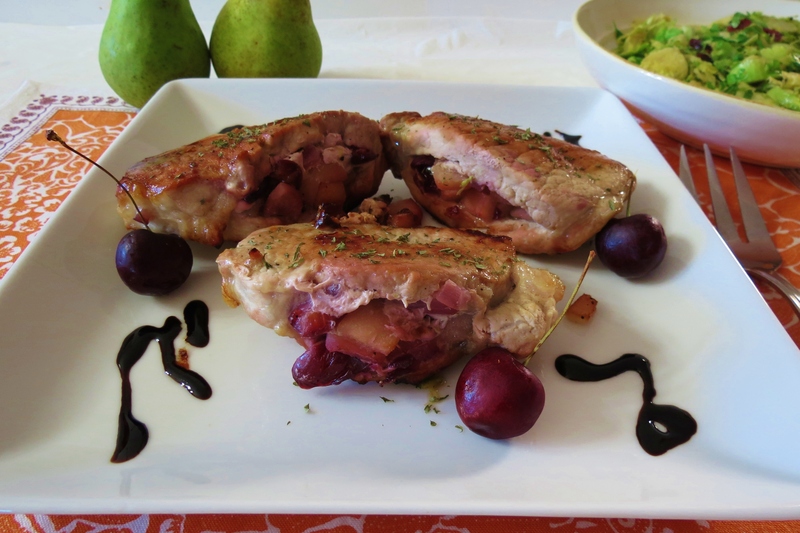 This is my Pear and Cherry Stuffed Pork Loins. I adapted this recipe from my Apple Stuffed Pork Loin. I purchased these pork loins from Trader Joe’s with no idea what I was going to do with them, until my CSA box came this week and it was filled with pears. Honestly it seems a little early for pear season, but hey, I’m not going to argue it since I like pears. Now I’ll be honest, these are not the best pictures, but don’t let that fool you. 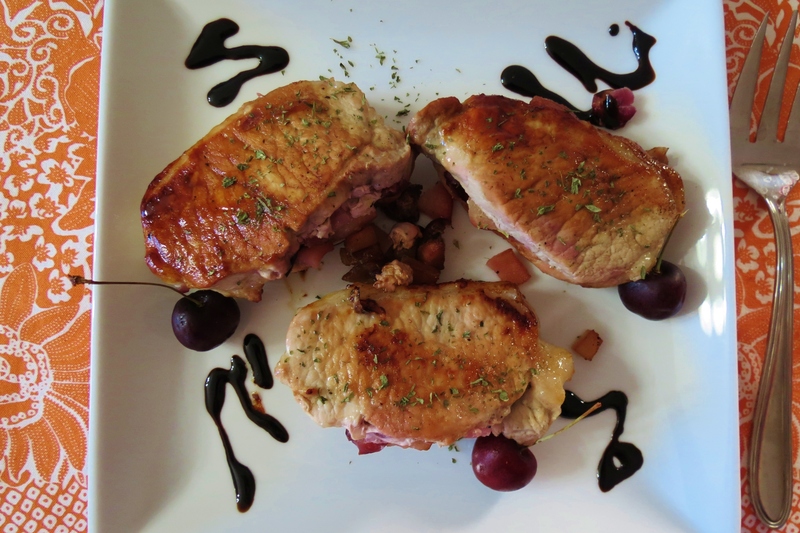 These pork loins are tender, with a hint of sweetness, mixed in with some savory. I really love the combination of sweet and savory together. For a little added touch I added some drizzle of Reduced Balsamic Vinegar that I also picked up from Trader Joe’s. I didn’t add it in the recipe, just added it to my plate. This is a wonderful recipe that takes about 45 minutes to make. I was undeceive about what I was going to serve as my side dish, so I asked on twitter, what should I make beans or Brussels sprouts? Brussels sprouts was the one chosen. So I decided to use one of my favorite Brussels sprout recipes, Orange Brussels Sprouts with dried cranberries. Yum, I forgot how much I like this recipe. Great choice my Tweeter Friends. 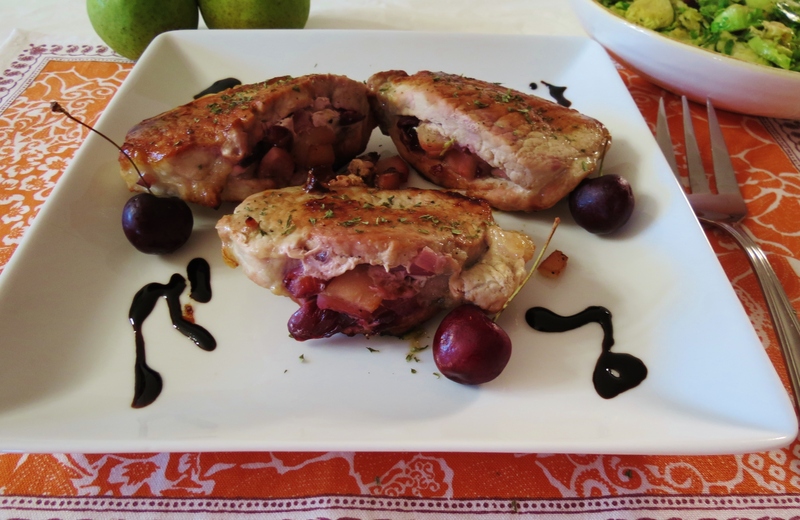 A sweet and savory stuffed pork loin filled with pears and cherries. 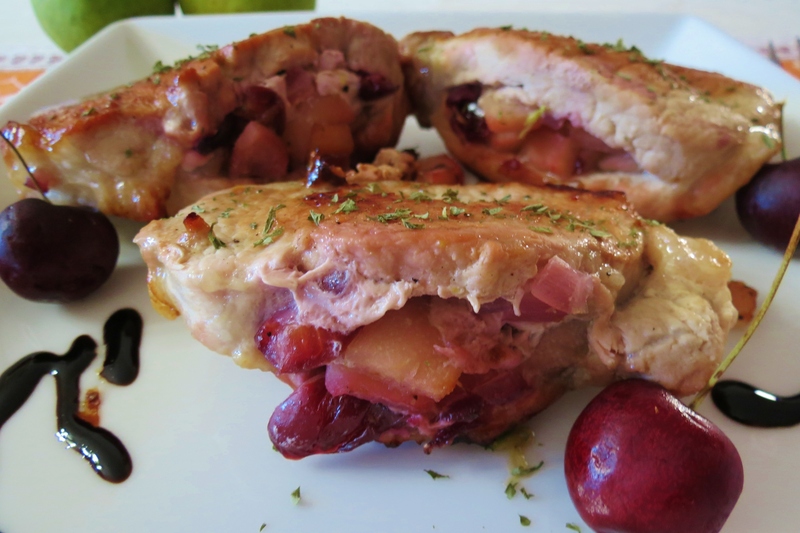 In an oven proof skillet, add butter, pears, cherries, onions and salt & pepper. Cook until tender, add ¼ cup of chicken broth and brown sugar. Stir until and most of the juice is evaporated. Add pear and cherry mixture into the pocket of the pork loin. If you have left over, just leave it in the skillet. Add Pork to skillet and brown on all sides. Add remaining chicken broth and bake in oven for 30 minutes or until pork is no longer pink. Since these pork loins were pretty big, I decided to cut mine in half to save on calories, fat and save room for dessert. I just have to remember not to get such a big pack next time I’m at the store. I tend to forget it’s just my Husband and I. Sometimes I’m glad he’s such a big meat-eater, so I know it won’t go to waste. If there are leftovers I’ll make a pork loin sandwich topped with sliced pear and maybe some cheese. Have you every had a pork sandwich from leftovers? Oh man it’s amazing!!! I am such a sandwich freak. I really wish bread wasn’t on the you “shouldn’t eat list”! I love it! I could give up any food but bread. So please, if we ever go to dinner, don’t get a bread basket because I’ll eat it all and ask for 2nds! Well that’s it for me today! I have a little time before bed so I’m thinking of my making yogurt cookies again, since I didn’t get any, well except a few out for the oven. What an amazing autumnal meal! 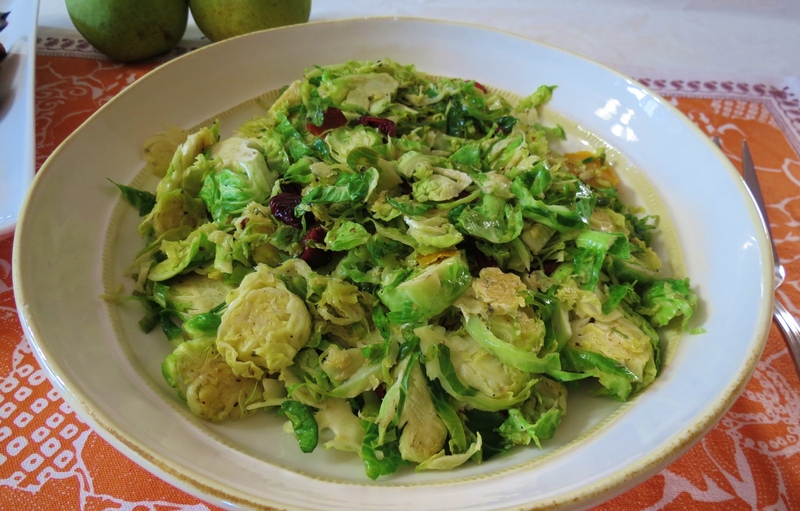 I love pears, too…and your Brussels spouts look divine as well! Thanks Liz!! My Husband got me hooked to Brussels Sprouts and now he barley eats them!! Crazy man!! Mmmm, I love sweet and savory recipes like this! Me too! I don’t know what it is about sweet and savory together but it’s a fantastic combination. This would be a big hit at my place. Oh my, this looks so delicious & gourmet! Have a great Labor Day weekend! Thanks Kristi! Have a great Labor Day weekend!! I bet it will be crazy in the city. This looks like a delicious pork stuffed recipe! I made some porks a little while ago but I stuffed mine with cheese! But I really want to try yours, it looks so delicious! Ohhh, stuffing them with cheese sounds good!! Yum! !